1.) Sometimes, the minimized mode bugs out and ends up taking up the whole screen (except the task bar) and won't move. A solution to this is resizing it, but I can only do it if I can find the right spot in between the taskbar and program to use diagonal resizing, and that's if that happens. It would be much easier if I could resize the program diagonally from the top where the title bar is. 2.) The music player used to start playing songs in TV mode, even when it was in desktop. Now, nothing shows up at all. There is no player down at the bottom and there is no music icon on the top right. In this situation, the only way to stop playback is to either restart the program or start video-based media and exit it. If you double click the program to go full screen, it seems to show a very thin slice of the currently playing album cover (Images: https://i.imgur.com/p2OVl1S.png, https://i.imgur.com/sKwMOv8.png). 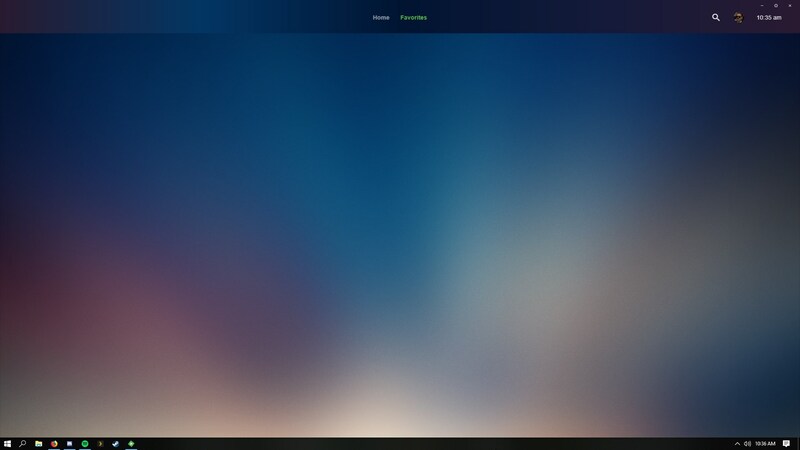 This suspicion seems to be confirmed as sometimes when I close the program, the full album cover flashes on screen before Emby fully closes, as if the image is behind the UI. I didn't get to see if there were any controls on that screen. These are server logs. I couldn't find anything in client for logs, but let me know if there is something. I'm running Emby Theater v3.0.6 on Desktop mode. There's the possibility that it was caused by a recent server update, because Theater itself hasn't updated in a while and it just started doing this a couple days ago. Currently running Emby Server v4.0.1.5-beta. If there's anything I can add, just let me know. Thanks! Edited by Derple, 31 January 2019 - 10:31 PM. Sometimes, the minimized mode bugs out and ends up taking up the whole screen (except the task bar) and won't move. HI there, can you please describe this a little bit more, or show a screenshot? I'm having trouble visualizing it. THanks ! The music player used to start playing songs in TV mode, even when it was in desktop. Now, nothing shows up at all. The bar at the bottom should be showing up. What device and browser are you using? It's not very consistent, and would likely be difficult to reproduce. I need to do some more testing. Basically, the program will launch like this (https://i.imgur.com/9KqHCk5.jpg) in "minimized mode", but the I'm unable to move the program around by clicking and dragging the title bar. If it happens again, I'll be sure to grab a quick video of it. I'm running Emby Theater v3.0.6 (web download, not store) on Windows 10 v10.0.17763 on my Desktop PC. The music player shows up fine on app.emby.media, but not the theater client. It used to not do this not to long ago, and the only thing that has changed since then would probably be the server updates, as I'm running the beta builds. I got it on video. It's a bit choppy and a bit small since it was recorded across all of my screens, but it should get the point across. I'd also like to add that the music player seems to have fix itself, as the bar at the bottom is now showing up during music playback. I tried disabling 2 of my monitors, but the program still acted up so I don't believe it's a multi-monitor issue. That being said, a few things to point out. 1.) When the program shows the Emby logo in the top left, and then it disappears, this is happening sometimes when I try to move the window while in minimized mode. 2.) These issues almost seem related to the minimize/maximize button and it's function. If I launch the program and it ends up working correctly, it will continue to work properly until I click the maximize/minimize button. 3.) The program often won't maximize on the proper screen, and will instead maximize on another screen. If you have any questions about the video or topic in general, feel free to ask. I'll be sure to edit if I missed something. Thanks!